Kerrie Lake, branch manager at our travel agents in Felixstowe, took a tour of China which included many of the country’s tourist highlights. Here’s how she found the trip. Our international flights were with British Airways and these were very good. Our outbound flight was a tad squished as we had two seats in the middle row of four at the back of the aircraft. However, the service, meals and onboard entertainment were faultless. We had a short flight with China Eastern from Beijing to Xian. After hearing bad reviews from clients, I wasn’t too excited about the prospect of travelling with them but was pleasantly surprised. The seats were roomy and we even had shared overhead entertainment screens. A drink and snack were also served. We had another short flight with Chengdu Airways. This aircraft was in need of some TLC as the seating was not very generous, but for a short hop it wasn’t too much of a worry. A drink and snack were served. Our first accommodation was in Beijing where we spent three nights. The hotel itself was very well presented, with a huge marble lobby area inclusive of bar and restaurant. It was a good 4* hotel, although it felt tired in places. The rooms were nice with large bathrooms but very hard beds. We also had problems with our air conditioning unit. This remained on 30 degrees for the majority of the stay and, although we repeatedly told reception about the problem, it was not rectified until we were about to leave. This meant having the window open overnight, leading to the discovery that a lot of building work happens in the early hours of the morning in Beijing. Our second hotel was The Grand New World Hotel in Xian. We only stayed here for one night but it was very comfortable. It was smaller than the first hotel but with a beautiful wall behind the main reception area with carved-out terracotta warriors. It really was impressive. Breakfast was full of options and so catered very well for guests of every origin. Our last hotel was in Chengdu. This hotel was probably the better located out of the three as it was close to lots of bars, restaurants and shops. Chengdu itself is really lively and felt like a really good city for younger guests. Whilst the room was the smallest of the three, the beds were lovely and comfortable and so this wasn’t an issue for us. In Beijing, we had a morning tour around Tiananmen Square and the Forbidden City with some free time to have a wander around. In the afternoon, we visited the Summer Palace. The next morning we were at the Great Wall. This was such a fantastic day; we were offered two areas of the wall to walk on and, fortunately, we chose the quieter side. This was a good choice as many of the other tourists went for the busier side and had to turn around and come back as it was too congested. This afternoon we visited a jade museum, where you could purchase locally carved jade products (beautiful but very expensive). That evening we had the Chinese Acrobatic Show which was included in our tour. This was a fantastic show and thoroughly enjoyable. Our last day in Beijing included a visit to the Temple of Heaven which I really enjoyed. As we walked through the park to the temple, we saw locals going about their daily activities; yoga, dancing, cards, knitting and there was even music being played. All at eight in the morning. In Xian, we headed straight to the city walls. Here you can hire bikes and cycle along the walls or just stroll around. The views over the city are fantastic; we were there for sundown and I really enjoyed the relaxed atmosphere. It was a nice place to relax after lots of moving around. The next morning we visited the workshop where the craftsmen recreate the Terracotta Warriors. Here you can purchase small ornamental pieces and souvenirs. We then visited the main attraction; the Terracotta Warriors themselves. We had lots or free time to explore and visit all or the main sites. It does get extremely busy, as you can imagine, but was a fantastic experience. The next day we were in Chengdu and our first stop was a visit to the Panda Conservation Centre where we had lots of free time to explore and take pictures. We spent a long time watching the pandas playing and hiding in the trees. Seeing the baby pandas was a real treat, although, as you can imagine, there was a huge queue to watch them. A lovely lunch was then provided and then we had more free time to enjoy ‘Swan Lake’; a huge lake with koi carp and black swans. It was a lovely area to enjoy an ice cream. We then visited the silk museum to see how silk is made, followed by the option to buy some silk wares. There were some beautiful pictures and furniture; I could have spent hundreds if not thousands. On the way back to our hotel, we visited Jinli Street in the Old City of Chengdu. Here there are lots of markets with stalls offering souvenirs. 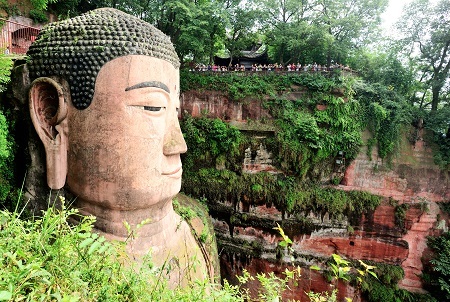 Our last trip in Chengdu was a visit to the Grand Buddha in Leshan. We took a short boat trip to view the Buddha and take lots of pictures. The Grand Buddha is the largest stone Buddha in the world and really is worth going to see. Excursions were included throughout the tour, although whilst on the coach we were offered some evening options that were payable. It would have been nice to have been given these options before we joined the tour so as to have a read up about them. We took up the offer of the optional excursions and saw the Kung Fu Dance Show in Beijing, the Tang Dynasty Performance in Chengdu and the Legends of the Face Changing Show. All meals were included and drinks were payable but were cheap. There were always options of soft drinks or beer, but wine is harder to come by and quite expensive. One highlight was obviously the Great Wall. You cannot comprehend the magnitude of this wonder of the world until you are stood in front of it. I will forever be grateful to have visited this historical site. I think getting to see the pandas was my favourite part of the trip and a really lovely way to end the tour. Even if you are not going to China to specifically see the pandas, it is a great addition to the tour and it was a day enjoyed by guests of all ages. I think it might have been a good idea to ask guests how they like their food. I found the food to be bland in most of the restaurants and it transpired that the group before us had not enjoyed the spicy food, therefore our guide had specified to not make the food as hot for our group. By the time we got to Chengdu I was really getting bored of the food, so a few of us spoke to the guide and asked if we could have some authentic spicy dishes. Luckily we got to experience some of the Sichuan Peppercorn dishes eventually, but it might have been a good idea to ask guests early on in the trip what their preference is so as to keep the food interesting. Also, more information on the optional excursions prior to travel would have been nice. I really would recommend this tour as it was a really good insight into China. You get a good feel for the country and get to tick off a lot of the major sights in one trip. It’s not for the faint hearted and is quite a packed itinerary so I would suggest adding a few nights post tour so that you have a few days to do things at your own pace before returning home. Lots of our fellow passengers had a stop in Hong Kong; some went on to do a Yangtze cruise and some even joined the Quantum of the Seas. Top Tip – Ask for extra duvets in the rooms. You can then place them underneath you to make the beds a bit more comfortable. 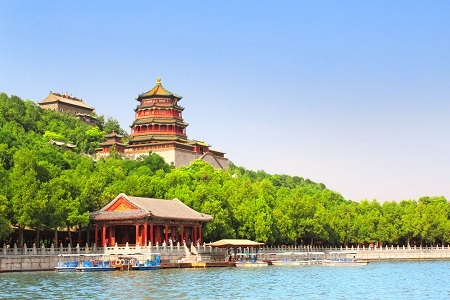 If you would like to see some of the highlights of China, on a trip similar to the one Kerrie took, we can help arrange your perfect itinerary. Visit our travel agents in Lymington, or any of the other shops we have along the south coast and throughout East Anglia, to speak to a member of our knowledgeable team.